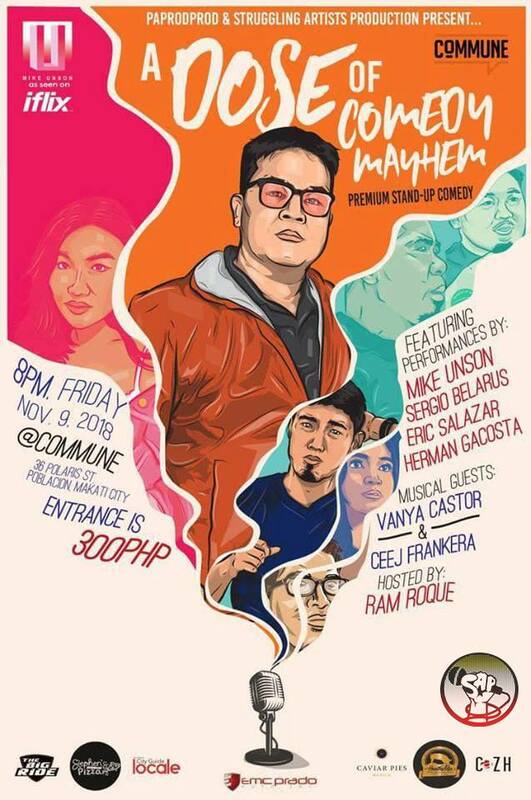 Get a Dose of Mayhem Premium Stand-Up Comedy at Commune! Headlined by Mike Unson, a 15-year veteran of Philippine POV stand-up comedy and 2016 Aliw Award Nominee who wowed audiences on “Hoy! Bibig Mo.“ on iFlix! With cohorts Sergio Belarus who competed in Showtime’s Funny One, Ad man Eric Salazar and writer Herman Gacosta. Hosted by Ram Roque with musical performances by Vanya Castor and Ceej Frankera. Happening Nov. 9, Friday at 8 pm. Tickets at P300. For reservations please contact #09198595848/09173504293. See you at Commune!